The Max Planck Institute for Mathematics mourns the death of Michael Atiyah, one of the giants of mathematics. 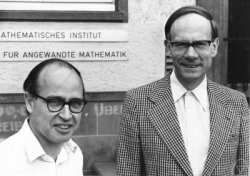 Over many decades Michael Atiyah was a frequent and welcome visitor, inspiring speaker, ingeneous collaborator, and friend to many of the mathematicians in Bonn. Together with Friedrich Hirzebruch, MPIM's founding director and one of Michael's oldest and closest friends, he laid the foundations for topological K-theory, an important tool in algebraic topology. He almost always gave the opening lecture of the annual Mathematische Arbeitstagung in Bonn, from its beginning in 1957. His famous index theorem (with Singer) was first presented to the larger mathematical community at the Arbeitstagung 1962 in a talk on "Harmonic spinors" and a follow up talk four days later with the title "Explanations of my preceeding lecture". For this work he was awarded the Fields Medal in 1966. Over the years, Michael Atiyah has been a regular and welcome guest of MPIM and an inspiration to generations of mathematicians in Bonn. He will be dearly missed.